Bach mouthpieces have been the industry standard since their creation by trumpet master Vincent Bach. These mouthpieces are designed to meet every conceivable playing need and have for nearly three quarters of a century. Ideal for any level of player, from beginner to advanced. 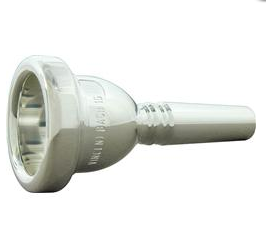 Available in different diameter sizes numbered from largest to smallest, will fit any large shank mouthpiece receiver.